Black Hills are tremendously varied -- and invariably breathtaking . . .
ground of East and West, mountains and plains, and moist to arid climates." A visitor or resident to this area simply cannot see or do much of what there is to see and do in the large Black Hills region in only a few days. 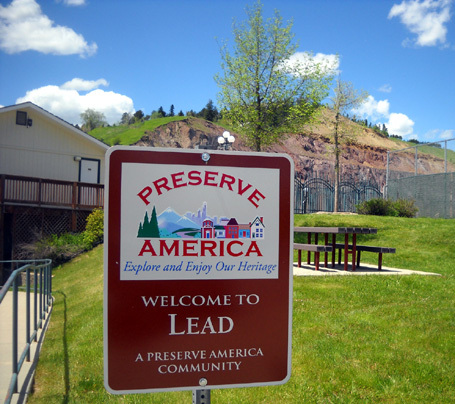 The national forest covers 1.3 million acres, plus there are several national and state parks and monuments, historic little towns like Deadwood and Lead, and all of Rapid City to explore. Jim and I have visited the Black Hills several times during our rather lengthy lives, both before we met and since -- Mt. Rushmore, Custer, Hill City, Keystone, Deadwood, Lead, Spearfish, Sturgis, etc. We always find new things to see, especially by visiting at different times of the year. For example, we got an up-close mini tour of the Black Hills in October, 2002 when we ran the scenic Mt. Rushmore Marathon. We took time to visit the famous national monument again and do some driving around to see even more striking golden aspen leaves against bright blue skies and dark evergreens. That was before we had a digital camera so I don't have any of those photos stored on my computer to access while we're traveling. 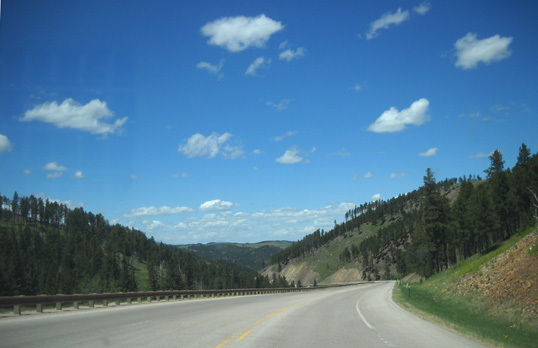 In May of 2009 we toured most of the roads through Custer State Park in our truck. 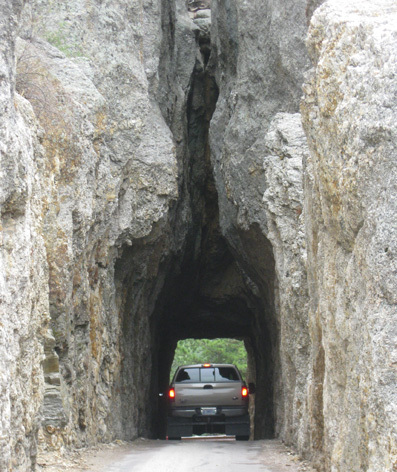 We did a loop that included Iron Mountain Road, with its cool "pigtail" bridges and tunnels, and the Needles Scenic Highway, which has really neat rock formations and places vehicles can barely squeeze through (you do NOT want to take most RVs on that road!!). 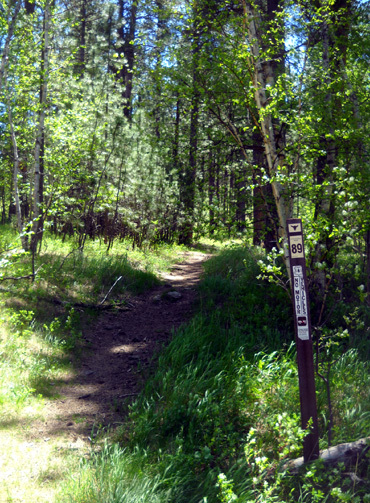 We also found parts of the Mickelson Trail and filed away plans of an end-to-end bike ride and/or hike for another trip. Earlier this month we explored a new area of the Black Hills where neither of us had been before -- Wind Cave National Park (see topics page for those entry links). We've barely scratched the surface of the things we want to see and do in this huge national forest! So I talked Jim into doing a scenic drive through part of the northeastern end of the national forest we either haven't seen before or haven't seen in many years. We did this on a warm, mostly sunny afternoon this past week. 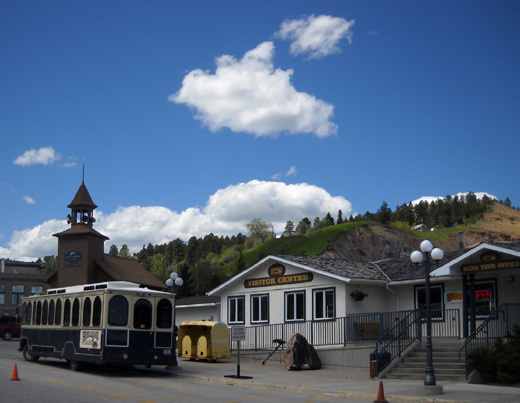 There are many different scenic loops visitors can take through the Black Hills. Some are described on various websites or you can make up your own like we did. It all depends on what you want to see/do, where you are staying overnight (Custer and Hill City are more centrally located in the Hills, e.g. ), and how much time you want to take. We drove west on I-90 from Ellsworth AFB to exit 57 in Rapid City, south on I-190 to Omaha Street, and followed the SD 44 West signs through town and out the southwest side on Jackson Blvd. This route goes by several nice city parks, Canyon Lake, a couple golf courses, and the road to the replica Norwegian chapel I showed you in the last entry. Soon after leaving the Rapid City limits we entered national forest land. Although SD 44 isn't marked as scenic on the AAA map, trust me that it is scenic. I'm convinced that some states have so many miles of scenic roads that AAA hesitates to mark all of them -- because less-scenic states will be envious! When we reached US 385 we turned north. The remainder of the miles we drove to Spearfish are marked scenic on our AAA map, and rightfully so. Soon after the Hwy. 44-385 intersection we briefly detoured on a little road to find the Deer Creek trailhead on the Centennial Trail; we might need to use that someday. After driving back out to US 385 we continued northwest for 24 miles to the juncture with US 14A. We climbed so gradually along this road that we weren't even aware of our elevation. This lush green grass in a field almost looks like a golf course, but it isn't. At the 395-14A intersection you can go north to Deadwood (we could see the town limit sign from there) or south to Lead. We went a couple miles south to Lead, which is pronounced "Leed," not "Led." (The English language is so confusing!!) I'll talk about what we did in Lead in a little bit. 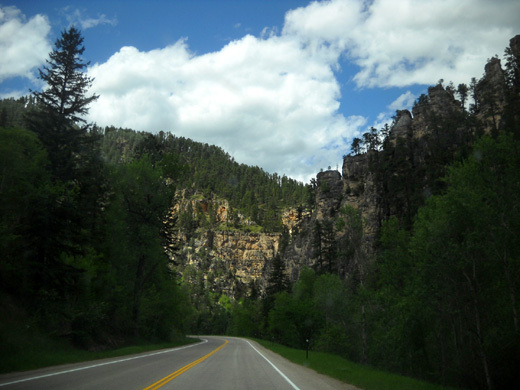 We continued on US 14A, looping south and west to Cheyenne Crossing, then west and north to Savoy and the beginning of the Spearfish Canyon Scenic Byway. I got side-tracked with a hike to Roughlock Falls before we drove through the canyon to Spearfish. From Spearfish we simply hopped on the freeway (I-90) and headed back to Rapid City and Ellsworth AFB. We drove a total of 140 miles and were done in about four hours, including the side trip to the trailhead, the stop in Deadwood, and my hike. UP AND DOWN AND ALL AROUND . . . The elevation in Rapid City is about 3,200 feet. We topped out at about 5,800 feet along US 385 near Custer Peak and the town of Lead. The highest mountain we saw on this loop is Terry Peak at 7,064 feet. The highest mountain in the whole Black Hills is Harney Peak, elev. 7,242 feet. It is just west of the Mt. Rushmore monument. We dropped in elevation to 3,640 feet through Spearfish Canyon. I've read that the creek itself drops 3,000 feet through the canyon from its headwaters in the mountains. 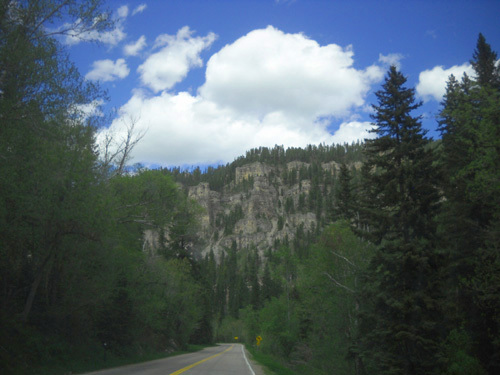 The scenic byway passes many rock walls through Spearfish Canyon. Our whole loop -- except for the short trip to check out the Deer Creek TH for the Centennial Trail -- is a route that is suitable for even large RVs. We were just in our truck, but we wouldn't hesitate to pull the Cameo through here. We've hauled 5th-wheels on much more challenging roads than these. 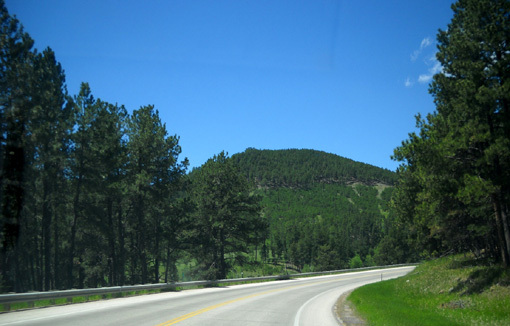 SD 44 and US 385 have wide curves and the 2,600-foot elevation gain from downtown Rapid City to the high point was gradual. The only narrow streets were in Lead. You can park at the visitor center if there is enough room, or on nearby side streets. 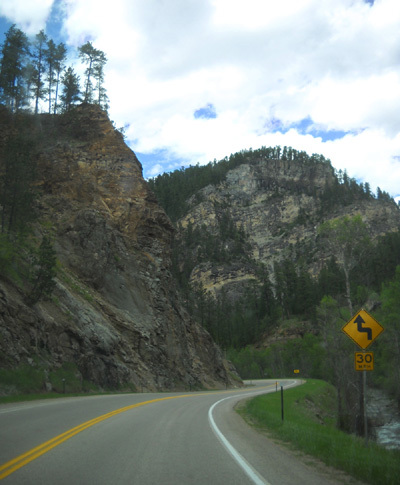 Although the road curves around a lot more through Spearfish Canyon and drops a couple thousand feet in elevation going north it's still a fine road for RVs of any length. The curves aren't too sharp and the grades aren't too steep. The two-lane roads all had good surfaces -- no construction or memorable rough spots. The only road construction we saw was on the freeway. As far as finding great scenery, I don't think you can go wrong with any route you choose to take through the Black Hills area. The whole 1.3 million acres of national forest land, in particular, is full of creeks, canyons, lakes, caves, mountains, interesting rock formations, meadows -- and trees. 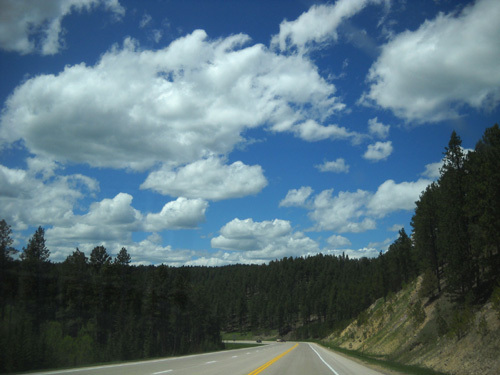 As you're driving through the Black Hills, they don't really look black. They look green, like most pines, spruce, and firs look up close. But from a distance, even half a mile away on a highway, they definitely look black. Sometimes I call the Black Hills the Black Forest by mistake. Although I've never been to Germany, my mother has so it's been on my radar for four decades. I assume the Black Forest got its name for the same reason. I enjoyed the scenery this whole loop. 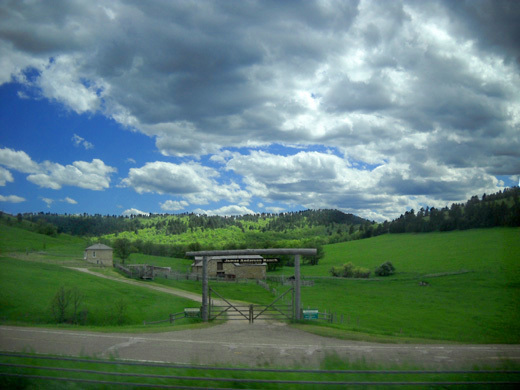 Even the drive on I-90 from Spearfish to Rapid City is scenic, with its rolling prairie and farmland against a backdrop of black hills. 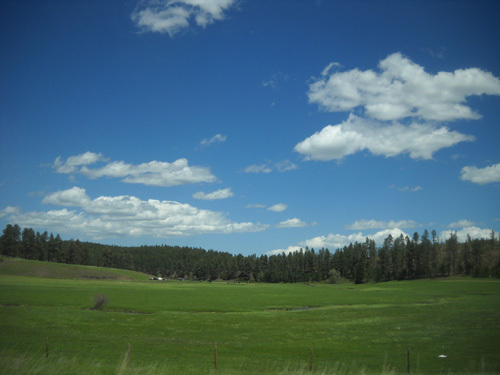 The freeway closely parallels the national forest for over sixty miles. 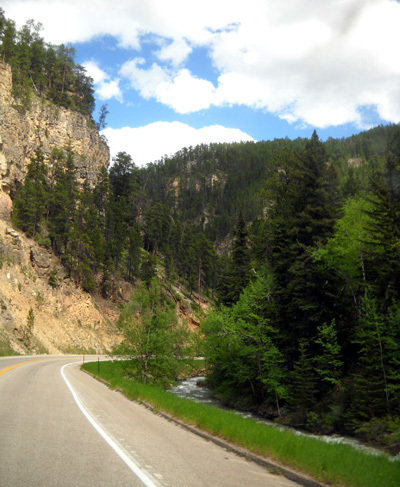 Spearfish Canyon was the most dramatic part of the loop. 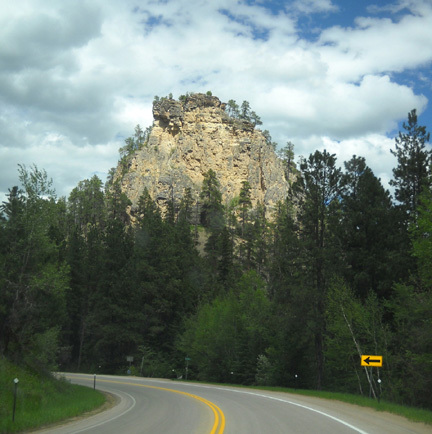 The ten miles on US 14A from Savoy to the edge of the national forest just before Spearfish follow Spearfish Creek through interesting rock walls and spires. We saw several people fishing and picnicking along the creek. 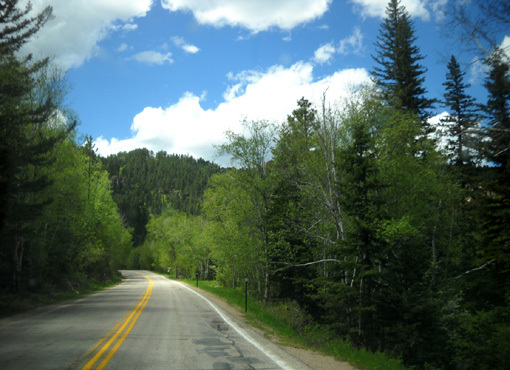 US 14A closely follows Spearfish Creek most of the way through the scenic canyon. We diverted off-route three times on this loop when we discovered interesting things to do that we didn't know about before starting out. That's fun! Sometimes I like to make impromptu decisions like this, instead of planning out every step of the way. I guarantee you there are many more things that can be done along this route, depending on your interests and time. Diversion #1 was realizing we'd be passing near a trailhead for the Centennial Trail. We went out of our way only a couple miles to check that out. That knowledge will come in handy if either of us ever rides or hikes those sections of the trail. Diversion #2 was in Lead. 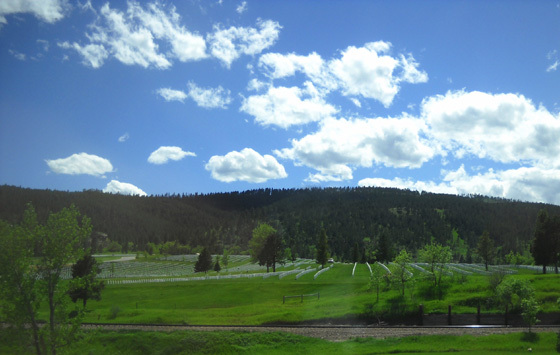 I asked Jim to pull over at the visitor center next to the famous Homestake Mine Open Cut. On that summer weekday there were few vehicles in the parking lot. 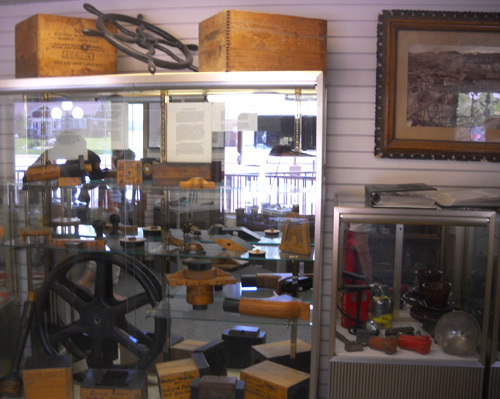 Although we didn't take the time to do a formal tour, we learned a lot about the mine's history in the visitor center/mine tour office and from the interpretive signs outside. 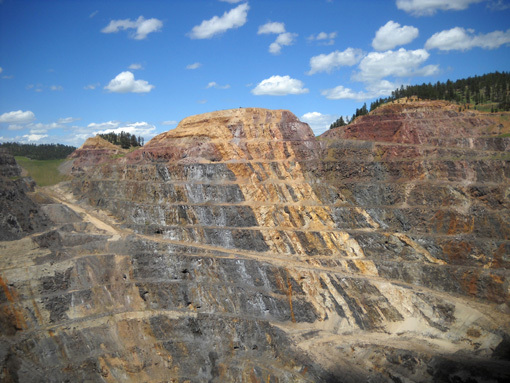 We learned that the rich lode of gold at what became known as the Homestake Mine was discovered in 1876. 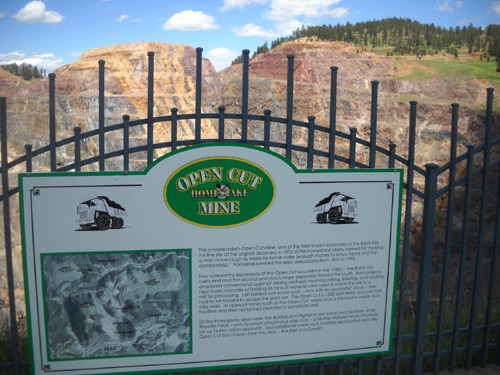 Before it closed in 2002, the Homestake was the oldest, deepest, and largest mine in the western hemisphere. Approximately 48 million tons of ore and waste rock was taken from what was a solid mountain -- and now is the hole shown in these photos -- between 1876 and 1945. The mine was closed between 1945 and 1983, when underground operations resumed for another nineteen years. 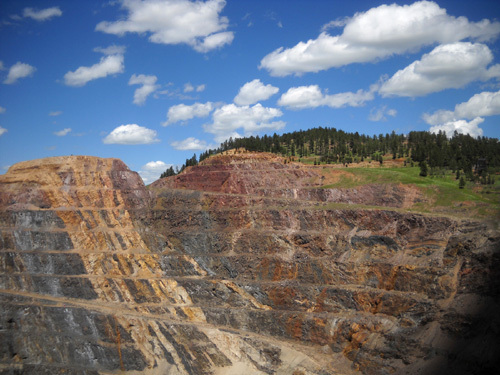 The more recent mining was done at 8,000 feet underground, more than 1� miles below the surface! The rock in Rhyolite Peak may be two billion years old. It certainly is colorful. The Open Cut is larger than it appears in these photos -- 1,800 feet wide, 4,500 feet long, and 1,200 feet deep, according to signs. In addition to gold, silver and iron were also extracted from this once-lucrative mine. You can learn more about its history here. Diversion #3 was hiking to Roughlock Falls near Savoy. That serendipitous find is the subject of the next entry. You can spend days searching links for things to do and see in the huge Black Hills National Forest area. 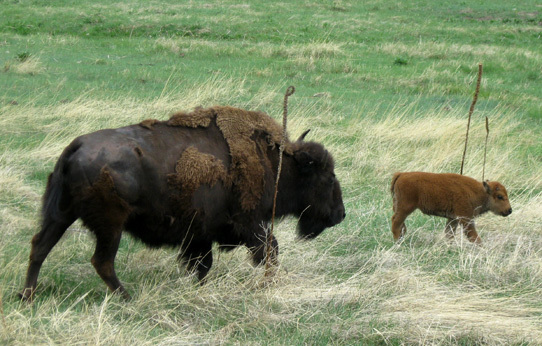 Two of the best sources I've found are www.VisitRapidCity.com (Convention & Visitors Bureau) and http://www.blackhillsbadlands.com. 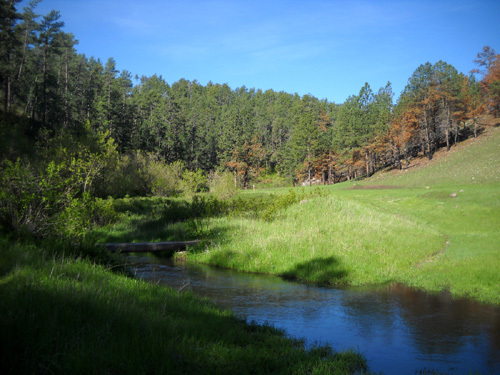 According to a magazine we picked up from the second source, the Black Hills are home to eleven reservoirs, thirty campgrounds, two scenic byways, 1,300 miles of streams, 350 miles of trails, and several functioning fire lookouts that are open to the public. In addition, state and national parks, wildlife preserves, and nature areas offer miles of pristine expanses. Popular recreational activities include hiking, nature and ranger walks, running, backpacking, road and mountain biking, horseback riding, picnicking, swimming, boating, fishing, hunting, golfing, cave tours, rock climbing, and cross-country skiing and snowshoeing in the winter. I'm sure there are more. More sedentary fresh-air activities include camping, photography, scenic driving tours, riding ATVs and Jeeps, watching birds and other wildlife, geocaching, rock hounding, gold panning, riding a tram or zipline, snowmobiling in the winter, etc. If outdoor activities like those don't appeal to you, there are plenty of man-made attractions to keep you busy, too. I can't even begin to list all of those. Whatever your interests, you can probably find more than enough things to keep you busy for several weeks in Rapid City and the Black Hills area. That's one reason we keep coming back.